Behold, darlings. A new T Lo record for most looks worn by a single person in one post. 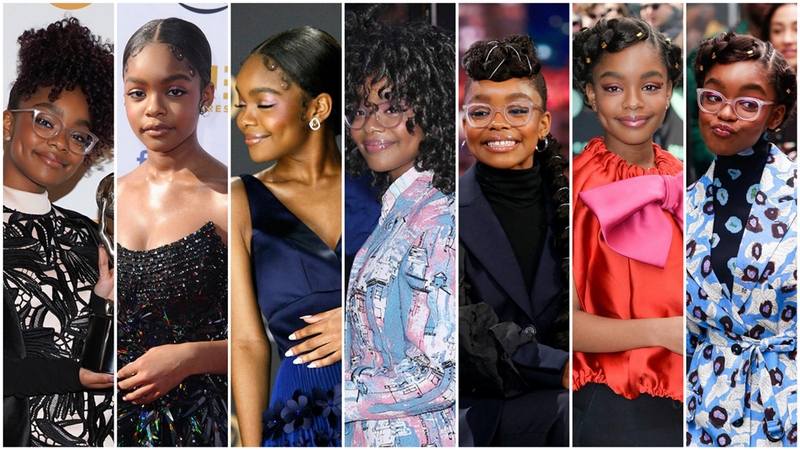 We knew Marsai was a fashion up and comer, but we should have realized that these days, in the massive wake left by previous up-and-comers like Kiernan Shipka, Zendaya, Yara Shahidi, Millie Bobby Brown and Storm Reid, a budding baby fashionista has to seriously up the game if she wants to stand out. Miss Marsai, we salute the hell out of you. As we always say, if you’re young, famous and love fashion, you need to take the opportunities that come with fame and get yourself as many stunning lewks as the industry will throw at you. We’ve got a lot of ground to cover and Miss Girl gave us eye-popping each time, so hydrate yourselves and let’s get to it. Okay, so. The theme here, if there is one, is “She’s young and adorable, so she can werq the cray.” We would not love the shape of this on most grownups, but it comes off whimsical (if vaguely nun-like), plus the hair and glasses really tone down on the severeness of the style and turn it into something fun. Well now this is just straight-up flawless. Again, those beaded “sleeves” might annoy on another wearer, but she can handle them just fine. The hair and makeup are chef’s-kiss perfect. Funny that the Viktor & Rolf is one of the more conventional looks she wore this week, since they’re known for their cray. This is lovely and she’s got a fashionista’s innate understanding of how to wear, werq and pose it. Our only quibble is the fit in the bust, which could’ve used some adjusting. LOVELOVELOVE. The print/color story: fantastic. The hair, glasses and simple white sandals: sublime. Girlfriend is CRUSHING these looks. Look at how much she’s feeling it. Good lord, we are looking at a Mozart-level prodigy here, aren’t we? L’il Miss Thing is serving up Fashion Editor realness like it’s nothing – which is a perfect tie-in to the movie she’s promoting like crazy right now. She is so incredibly confident, poised and feeling herself, which is how you want a 14-year-old ingenue to look when she’s all dressed up and promoting herself. She’s fourteen. She can werq it but no one else can. The shoes are adorable and the hair is to-die. Little Ma’am, we are bowing down. You are doing this so right and so well and to such a clearly confidence-boosting level that we can do nothing but offer our huzzahs and bravas. You are NAILING it, Miss. This look is so fricking cute-chic we can’t even stand it.